Is Referral Marketing Primed to Explode? Is Refer-a-friend marketing about to explode? Do you remember your first steps in paid search, email and affiliate marketing? If you started after 2009, you probably had a world class integrated platform with an intuitive interface offering all the statistics and insights you needed to amaze your boss. Whereas real early adopters had no proper tools and, for example, probably used Hotmail and mail merge for their first email campaigns. Between these two extremes, you probably would not have realised the full potential of the channel until the right tools and platforms arrived, such as Exact Target for email. All new digital marketing channels seem to have followed this similar evolutionary pattern and we can see that this is happening for referral marketing, which after all is one of the oldest forms of marketing. Those old enough to remember being able to get a free drink at a bar by saying ‘Tony sent me’, probably didn’t realise it at the time but that was classic ‘friend get friend’ marketing: you got a free drink, the barman got a new customer and Tony got a kick back. Well of course, something as good as this just had to move online, but until now it hasn’t really taken off. I believe this is because marketers have not yet had the right digital tools and platforms to allow it to really explode online. Just Google ‘referral marketing software’ and you will find a host of simple ‘refer a friend’ platforms that offer your customers, once they have finished the checkout process, the chance to earn a discount or some cash by getting a couple of friends or family members to buy. While these are often simple to put in place, just requiring a few lines of code on your shopping cart, and give a glimpse of the potential power of social referrals, many companies we have spoken with have been a little disappointed at the inability of these schemes to scale and/or their tendency to fizzle out after a while. I believe that is only because these schemes are being hamstrung by the tools and platforms being used by marketers. It’s time to move beyond the referral marketing equivalent of Hotmail and mail merges…. Early adopters were often small groups of individuals ‘learning on the job’ and sharing knowledge via ‘hacker-like’ forums. These pioneers often had virtually no technology to speak of and recorded data in Excel or used server logs to count clicks. The laborious and clumsy nature of these tasks did not matter much as operations were typically small scale, low spend and there was almost no competition. As mentioned, the ‘Wild West’ days of email marketing in the 1990s relied on Excel, Hotmail and mail merge. While the first affiliate deals can be traced back to Cybererotica and PC Flowers & Gifts in 1994, those were often based on personal relationships between the founders of different websites. Yes the web was small enough then for most of the first webbies to actually know each other! In paid search, despite the improved accuracy of Google search results at the turn of the century and the introduction of pay-per-click in 2002, many of the first practitioners worked from home and earned easy money just buying ‘branded keywords’. Once the forerunners proved the channel’s potential, the next stage saw the development of simple tools to automate tasks and provide basic statistics. These would typically get better over time but generally remained focused on one task and would not integrate with other software. As email inboxes were saturated with junk mail, new laws like the UK Data Protection Act 1998 and the US Can Spam Law 2003 regulated emailing and improved anti-spam technology like the Sender Policy Framework, introduced in 2004, made it easier to combat spam. These developments created a demand for more professional software to improve deliverability and ensure legal compliance. As affiliate marketing outgrew personal friendships, professional networks started to emerge: Linkshare and BeFree (both 1996), Commission Junction (1998) and Affiliate Window (2000). These enabled affiliates and merchants, often in different time zones, to find each other and, lacking the trust present in the early informal deals, introduced transparent and trustworthy tracking and payment systems. In paid search, some of the first bid-management platforms, including those that were later to become industry leaders, emerged within a few years: Efficient Frontier (2002), Acquisio (2003), Marin (2006) and Kenshoo (2006). At first these only focused on bid management for search ads but progressively integrated with analytics and testing tools. Eventually as the channel becomes increasingly mainstream, enterprises and their agencies increase adoption. This stage sees a rapid development of the tools, as new features are added, standards are developed and the software is integrated with other enterprise level software like Salesforce. We end up with enterprise level tools capable of scaling to multi-million dollar spends, with accurate analytics and reporting. The power of these enterprise tools often means that those left with the previous generation of technologies can no longer compete. Today’s leading email service providers like Exact Target, Emailvision, Cheetahmail and Silverpop don’t just focus on anti-spam compliance and deliverability but provide a host of A-B testing and browser optimization tools, mobile responsive design templates and integrate with CRM tools like Salesforce. As the affiliate industry became ever more complex with smartphone and video sourced traffic, we have seen a concentration of the industry around larger players like Affiliate Window, Linkshare and Comission Junction who are able to invest in new tracking tools and provide transparent affiliate directories like Affiliate Window’s Darwin. Following large capital raises from 2008 to the present day, the paid search software providers mentioned above evolved to become industry leading integrated platforms for managing very large spends efficiently across search, display and social with tools like audience segmentation and predictive buying signals. Where is Refer a Friend Marketing Today? It’s no surprise that referral marketing is following the footsteps of paid search, affiliate and email marketing. Currently, I believe refer-a-friend marketing is towards the end of the second stage where the available platforms do not yet provide all the necessary marketing tools to allow it to explode. While social is the lifeblood of referral marketing, most of today’s platforms limit themselves to simple sharing buttons. Where’s the entertainment? The dynamic rewards? The gamification? The real social. Frictionless sharing and social logins should be merely the beginning, and yet even this simple functionality is rarely present in today’s platforms. Make heroes of your best advocates and referrers. Celebrate them on social. 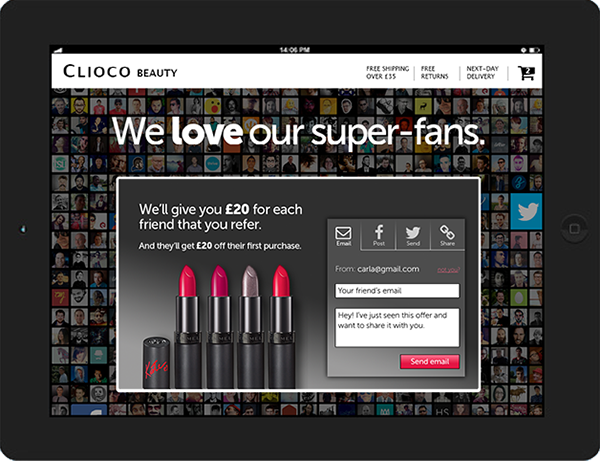 Today’s platforms typically only allow referral from the checkout thank you page, after the customer has finished their purchase. The very last thing you want to do at that point is refer a friend. You want to check your email to make sure you get order confirmation, and then wait for the product to arrive. Platforms should facilitate referral at a point customers are most likely to refer – not the least. That means elegantly weaving referral opportunities into all of the touch points with your customer – across, digital, social, mobile and in store. Refer a friend marketing today is all about 1-2-1 rather than 1-2-many. If you find a customer wanting to refer why limit them to just one friend. 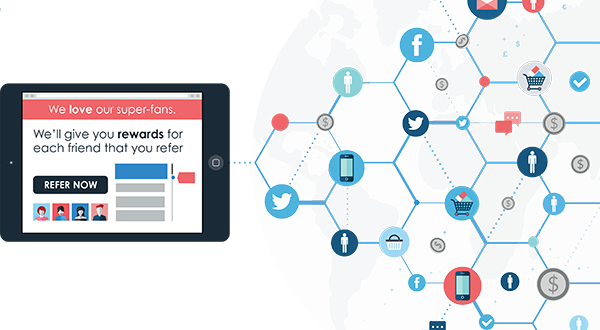 In a world where we are connected to groups, to communities, to networks of friends and to work colleagues, shouldn’t referral marketing platforms take full advantage of that? Platforms should be built to maximise referrals not minimise them. Shouldn’t prizes be linked to performance – the better the performance the better the prize? Easier said than done with most of today’s tools. Basic refer a friend schemes, where both you and your friend get a [$10] voucher when he joins, get old quickly! Platforms should allow you to collaborate with your customers, letting them influence the rewards; and for rewards to dynamically improve as more people sign up. Imagine receiving the same marketing email from a retailer every single day. No changes to copy, to tone, to approach. It would be terrible, and yet that’s the approach most companies take to their referral marketing scheme. These are your best customers and you should listen to them – not bore them! However, the evolutionary path taken by other digital channels makes me hopeful that referral marketing platforms will all soon reach enterprise grade, where brands will be able to emulate the next Social Customer get Customer carried out by innovators like O2, Fox and Tesco. Soon Refer-a-friend marketing will be as important to us as email and paid search, and we’ll look back with humour at the basic tools we were forced to use! Here at Buyapowa we’re obsessed with Social Customer get Customer (as you can probably tell from this article), and building the best referral marketing platform there ever was! For some examples of how these brands are using the Buyapowa platform to do Stage Three refer-a-friend check out this video. If you would like to know more about how leading brands and retailers are using Buyapowa’s referral marketing platform to drive incremental customer acquisition, please drop us a line or book a demo. Tesco Wine: The Most Extravagant Co-buy Ever! An abridged version of this article was recently published on My Customer.